As Good as it Looks from Bakers Complete is full of juicy meaty chunks, tasty country vegetables and luscious gravy and smells like a home cooked meal. 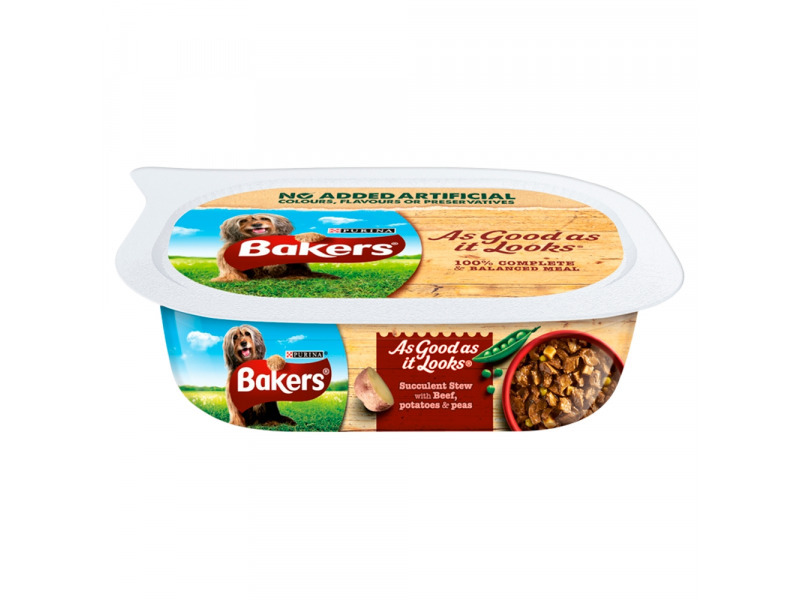 Every recipe is full of top quality ingredients which provide all the essential vitamins and minerals which help to keep your dog healthy, happy and active. These 100% balanced complete meals also contain no artificial colourings. Every meal comes with a re-sealable transparent tub so you can see all the wholesome ingredients yourself. Meat and animal derivatives* (of which chicken 4%), vegetables (carrots 4% from dried carrots, green beans 4% from dried green beans), vegetable protein extracts, derivatives of vegetable origin, fish and fish derivatives, minerals, various sugars, oils and fats. *chunks: 43% meat and animal derivatives, of which min. 26% meat. Meat and animal derivatives* (of which beef 4%), vegetables (potatoes 4% from dried potatoes, peas 4% from dried peas), vegetable protein extracts, derivatives of vegetable origin, fish and fish derivatives, minerals, various sugars, oils and fats. Meat and animal derivatives* (of which lamb 4%), vegetable protein extracts, cereals (cooked rice 4% from dry rice), vegetables (carrots 4% from dried carrot), derivatives of vegetable origin, fish and fish derivatives, minerals, various sugars, oils and fats. Meat and animal derivatives* (of which turkey 4%), vegetables (carrots 4% from dried carrots, peas 4% from dried peas), vegetable protein extracts, derivatives of vegetable origin, fish and fish derivatives, minerals, various sugars, oils and fats. Meat and animal derivatives* (of which beef 4%), vegetables (potatoes 4% from dried potatoes, carrots 4% from dried carrots), vegetable protein extracts, derivatives of vegetable origin, fish and fish derivatives, minerals, various sugars, oils and fats. Meat and animal derivatives* (of which duck 4%), vegetable protein extracts, bakery products (cooked pasta 4% from dried pasta), vegetables (green beans 4% from dried green beans), derivatives of vegetable origin, fish and fish derivatives, minerals, various sugars, oils and fats. Mn (E5): 7.2; Zn (E6): 100; Se (E8): 0.067. 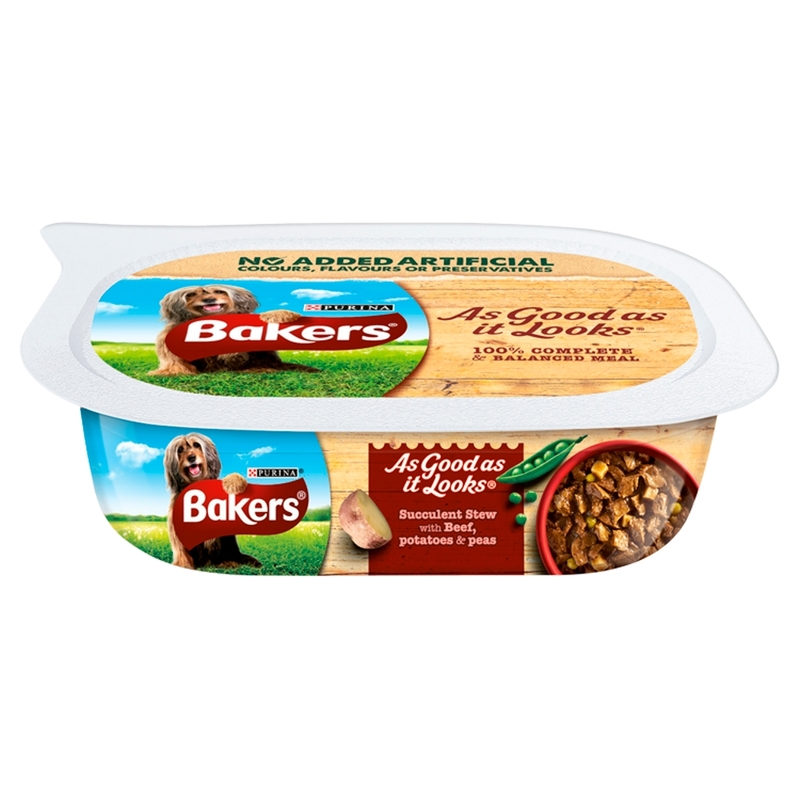 Just like Bakers Complete, Bakers As Good as it Looks has been carefully formulated to provide 100% of the nutrients your dog needs every day to help him stay happy, healthy and active. Adjust feeding amount depending on your dog’s body size, activity level and external temperature. Clean, fresh drinking water should always be available. Please store this tub unopened in a cool, dry place. After opening, refrigerate and use within 2 or 3 days. 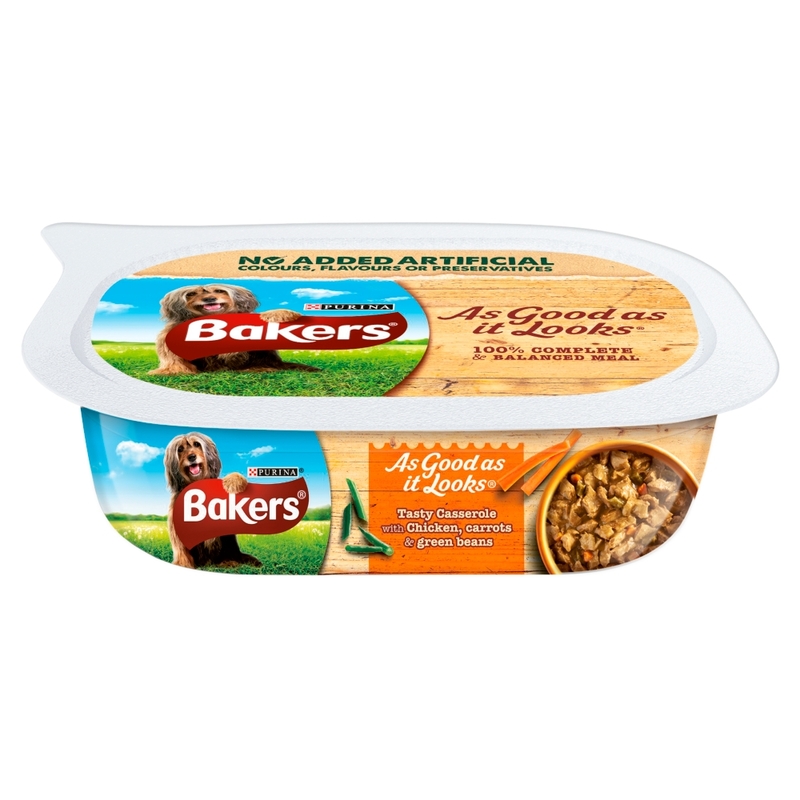 There are currently no questions for Bakers Complete Adult As Good as it Looks Dog Food - be the first to ask one!